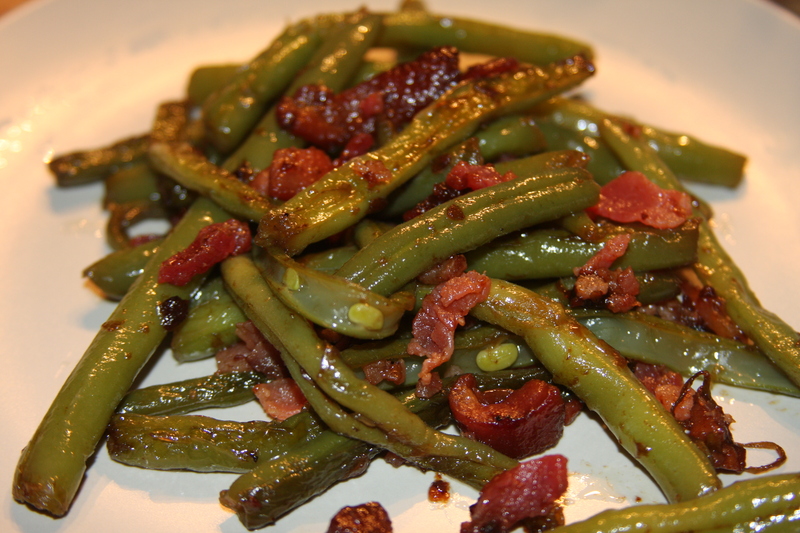 These green beans are such a favorite in our house that my mother won’t even eat green beans anymore unless they are cooked this way! They are a great mix of sweet (from a little sugar) and salty (from the bacon) and I think you are going to love them! They are super simple to make and if your bacon is done ahead of time, only take about 15-20 minutes. They are a perfect side dish and can be cooked along side of whatever the main course is. ** If you are on a gluten free diet you can substitute the processed bacon (sodium nitrates=bad for those with Celiac Disease) for something like one of these Hormel gluten free bacon products. Both of these substitutes can be found in most of your local grocery stores. Heat bacon grease (or oil and butter) in a skillet over medium heat until hot. Then add onion and sauté for about 3-4 minutes. Add 1/4 of the bacon to the pan and cook for another 2 minutes. Add all of the green beans and sprinkle on half of the sugar and keep stirring until all of the beans have been coated, about two minutes. Add about 1 cup of water, cover and simmer for about 12 minutes, stirring about half way through. Check to make sure the water doesn’t completely evaporate before time is up. If it does, just add a little more water. Remove lid and sprinkle over remaining sugar and stir well, cooking uncovered for about 2-3 more minutes. Then add remaining bacon and stir. Let cook for about another 2-3 minutes without lid. Stir well and serve. This entry was posted in Bacon, Gluten-Free, Recipes, Sides, Vegetarian. Bookmark the permalink. It does sound like a really delicious recipe – I can see why your mum insists. You should try them…SO good!